The internet is a fantastic place for children to learn, explore and broaden their horizons. The latest Ofcom research has shown that 91% of 5-15 year olds live in a household with internet access and over a third of all 3-4 year olds are now accessing the internet in their homes. More than this, over three-quarters of children aged 10 to 12 in the UK have social media accounts, even though they are below the age limit, a survey for CBBC Newsround suggests. Many teachers, and schools, are now integrating online research, tools and even games into their teaching programmes but there are concerns. Parents, teachers and authorities are worried about the harmful content available to children online, as well as the student’s general safety. We know that children need support in these environments, to get the best out of using the Internet, and there are real advantages in making sure that children are supported in their Internet use right from the start. In this blog, we share five core themes to explore and teach in order to help your students stay safe when using the Internet. Remember that line from the Disney cartoon Bambi: “If you haven’t got anything nice to say, don’t say anything at all!”? It’s important to help students realise the impact of their activities online. When students post messages, blogs, photos and stories online this can have a direct impact on them, but it can also impact the lives of others. Cyber bullying is rife on the Internet. Most young people will experience it or see it at some time, in the form of harassment, denigration (sharing false information), flaming (stirring online arguments, often with abusive language), impersonation (hacking someone’s identity), stalking and even exclusion (where someone is left out of e.g. a group message). In a recent national bullying survey run by Bullying UK’, 56% of young people said they have seen others be bullied online and 42% have felt unsafe online. Cyber bullying can happen 24 hours a day, 7 days a week and it can go viral very quickly. Consider too that content posted privately online can be publicly shared by others, and may remain online forever. It’s important, then, to help your students realise the impact of their actions online – a comment made in jest can be hurtful and reach a huge amount of people. We should all treat people how we would like to be treated online and in real life. You may have seen those posts on Linked In: it’s a photo of students holding pieces of white card saying “How far can this photo go?”. The class post a photo and ask people to like / share it to see how many ‘impressions’ it can get via social media, and how quickly this happens. This is a great exercise for showing students the potential reach of their online activity. Things they post can impact them and other people, now and in the future. For example, sharing personal information online (such as email addresses, or even photos which disclose locations / street names) can be dangerous. Likewise, older students posting social photos and news updates could impede their job search as recruiters vet their online profiles. It’s important to help students of all ages to understand the reach, accessibility and impact of their social media posts. It’s important for students to consider the reliability of online material and be aware that it might not be true or that it could be written with a bias. A core strategy for assessing information online is to read multiple sources, and check several web sites before accepting what they read. As a teacher, you could find two news stories and invent or adjust the details on a third and encourage groups of students to find out which stories are true and which have been altered using multiple sources to back up their conclusions. The power of advertising – and its potential power over us – is an important lesson for all students to learn early in life. In the online world, advertising has become more and more invasive, and integrated in daily life. For example, users may be distracted by advertising and pop ups and with just a couple of clicks find themselves downloading harmful content, or, they could inadvertently spend money online, for example within smartphone or tablet apps. Bookmarking sites or creating a ‘favourites’ list is a simple way to help your students find the content they want without having to search the Internet for it. Adding controls to in app purchasing options is also a good failsafe. It’s also important to encourage students to keep their personal information private; you could suggest using a general classroom email address when filling in online forms and this will mean they will avoid being inundated with spam and junk email. You could also teach them how to block pop ups. Children are naturally curious and will innately push boundaries. Be positive and embrace the technologies that your students enjoy but establish clear expectations – in the same way that you set rules for classroom behaviour, establish your expectations regarding online activities. Creating a classroom agreement is a useful step, which might include rules about time spent online, sites that can be visited, and behaviour expected. It’s a great idea to agree these rules from the outset, so that you and your students are aware of their boundaries. The internet is an amazing resource which enables children and young people to connect, communicate and be creative in a number of different ways, on a range of devices. One way to help ensure their online safety is to consider filtering software to block unwanted content. 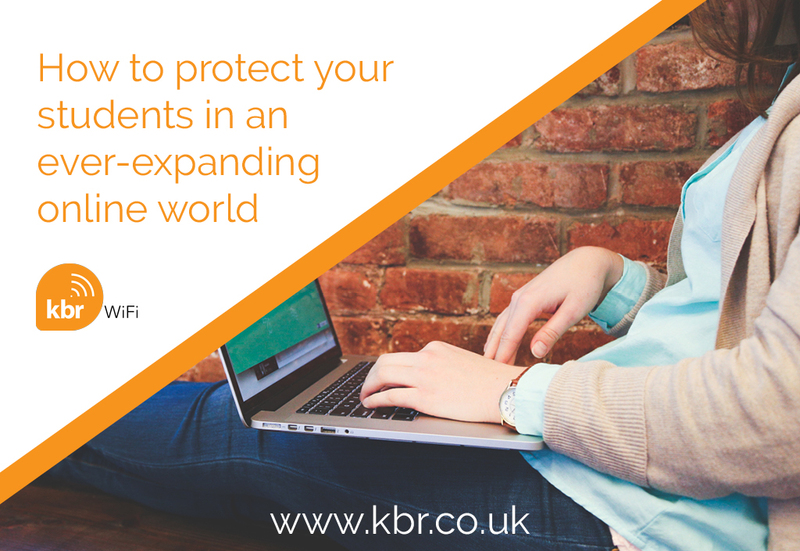 KBR are industry experts when it comes to setting up filters in schools, both on broadband connections, and on individual devices. These will be useful tools for your school but it is important to also discuss with your students what they might see online. We hope you find this blog useful to prompt some key discussions.